As we get closer to summer there is more and more work to do in the kitchen and the garden. As usually i try to get done everything right away which ends up in a tragic, exhausted moment when I realize that it is impossible. At least not immediately. First of all I need to remove all weeds from our tiny but wonderful kitchen garden. But I shouldn’t forget to pick some fresh radishes and green onions, caramelize them in butter and eat it with a bunch of salad, pasta or some fried cheese bites that I make from my neighbor’s fresh cheese. I want to prepare another portion of the elderflower syrup I made two weeks ago. I am worried that flowers won’t last until I get there so I am willing to go out even when it is raining to pick the flowers. But also it is important to enjoy the moment when I pour ourself a bit of the syrup i made last week, fill it up with water and add some extra drops of lemon juice. This is our first own elderflower syrup, from our own bushes in our first year in the Hungarian countryside. I am also worried about the aphids that attacked one of our cherry trees. I am searching informations in books, on the internet, trying to find a way which is not chemical but natural. I check our tree every day to see whether it is worse or not. András who helped us pruning the trees says it is not so bad so I shouldn’t worry about it and I hope he is right. In any case I follow my grandmother’s instructions, I take rubber gloves and look for nettles in each hidden corner of our garden. I put the nettle in a bin, fill it up with water and leave it outside in the sun for 1-2 days. Soon I can use it by filling up a spray bottle and start experimenting with this biological method. In the meantime I remind myself to take a break, sit down on the stairs next to our front door look at the cherry tree without noticing the aphids and think about the cherry strudel and other sweets I am going to bake from the harvest. I should cook some strawberry jam as well. Kata, the loveliest grocery owner in the world says that it is the time to begin. So I buy 6 kilos of it and start to prepare it although I feel deep in my heart that this jam cooking project will be the last step to get myself overloaded completely. But still, I am longing for home-made jams. While cleaning and cutting the strawberries, I put some into my mouth as well, breathe deeply from the sweet and fruity scent of the jam and look at the garden from the opened summer kitchen door. A walk with my dog in the forest is for me the perfect way to stop my rushing thoughts about the to do lists. Slowly I learn how to walk not rush, how to see and not only look. On the way I discover some wild thyme and wild strawberries which are just about to ripe. At the weekend Móni and her husband come to visit us. 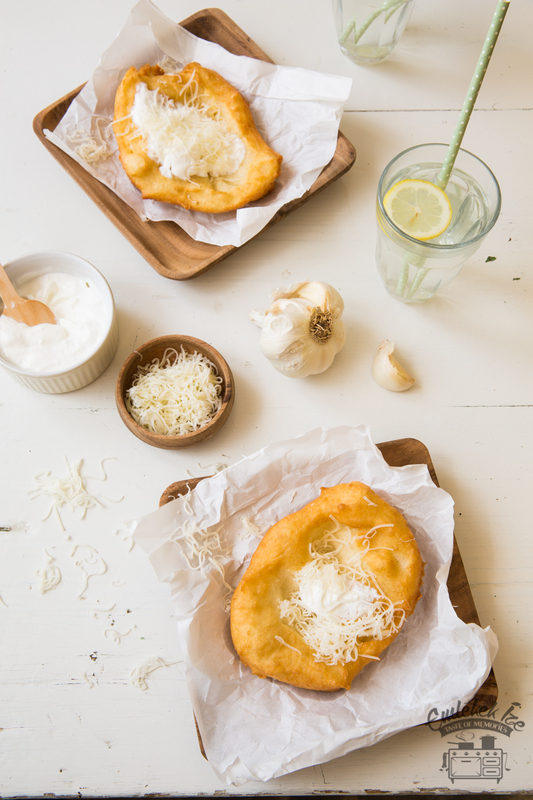 I prepare lángos, a traditional Hungarian street food which means for us the feeling of summertime, friends and fun. 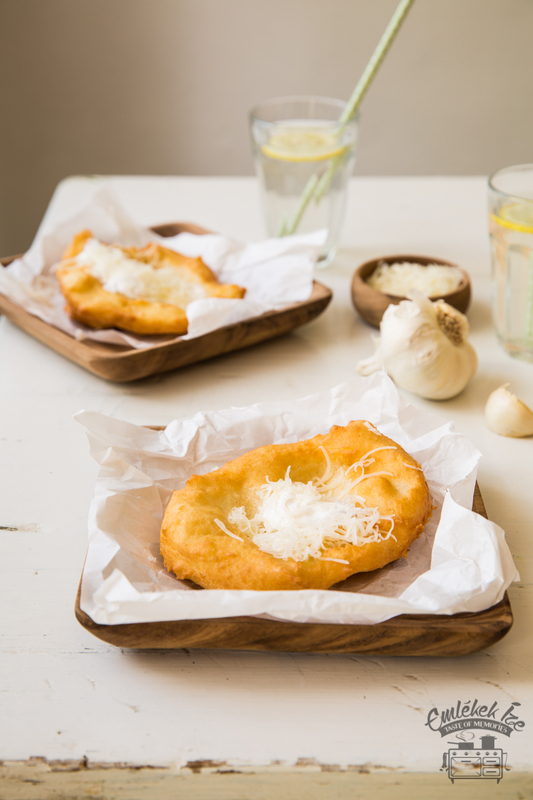 I put kefir into the dough which makes it lighter and softer and if you want you can even put the dough into an oiled plastic bag, close it and keep it for a week in the fridge so you can fry some lángos any time you want. I grate some cheese and add some garlic to the sour cream. 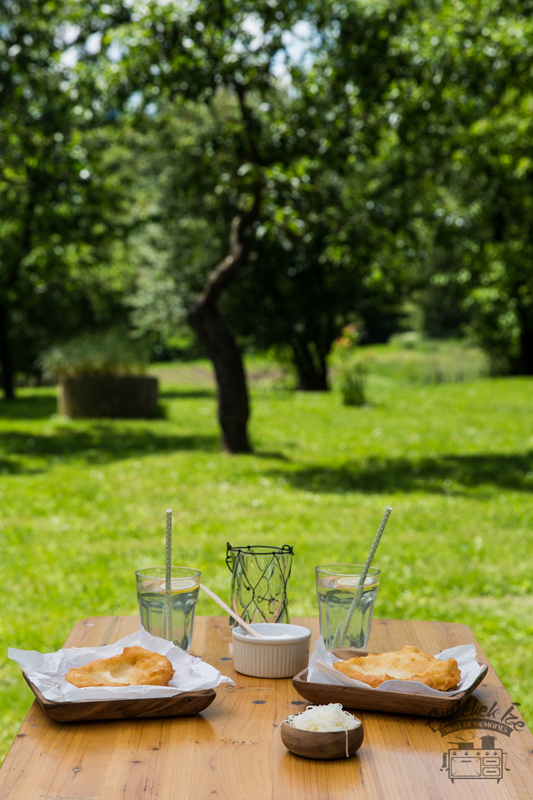 We sit down under the fruit trees and slowly to do lists and all things that worried me seem to be very far away. 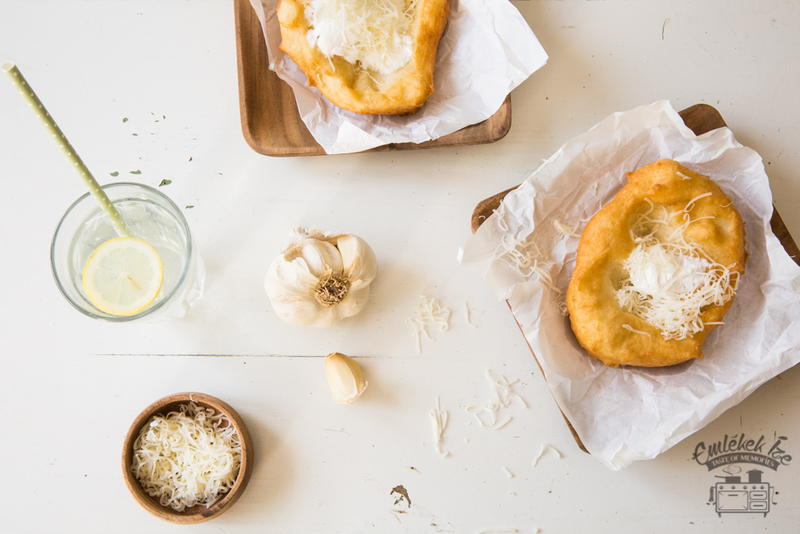 We eat the lángos, the warm sunshines brings us the promise of summer and I realize that the most important things in life don’t need to be written down in a to-do list. Mix flour and salt, warm up the milk until it is lukewarm and mix 100 ml of it with the yeast and sugar. Cover it and let it rise for 5 minutes. Add yeasted milk, kefir, egg, oil and the rest of the milk to the flour and knead it well. Cover it and let it rest for an hour. Press the garlic and mix it with the sour cream. Grate the cheese. Heat oil in a deep pan, wet your hands and take a piece of dough, pull it a little bit so it will be flat and thin. Fry it in the oil, turn it when one side is golden brown. Put it on a paper towel to absorb excess oill. Serve it right away with the sour cream and the grated cheese.